I’ve done some more English paper piecing while I wait for parts for my sewing machine to come in. I’m really enjoying it a lot, but I’ve hit a wall in terms of planning, at least a little bit. Planning a Pattern? or random? The core issue is not what to make — I have plenty of ideas about that — but rather, what is the scale at which I wish to work? 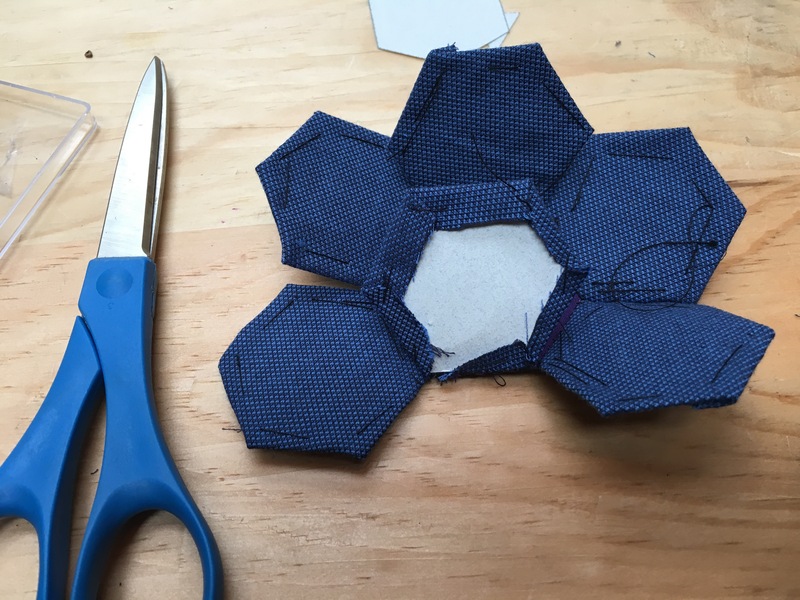 These hexagons are 1 1/4″, and in some ways they’re too small for what I’d like to do — but if I go much bigger than that, my intended projects will get Way.Too.BIG, Way.TOO.FAST. That’s always the way of it, though, isn’t it? Whatever project or plan we might be intending to pursue, there’s always the question of limitations and boundaries — old Saturn binding us in his everlasting chains? Perfection and decrease follow from increase and growth, as surely as sunset comes sometime after noon. In teaching, we speak a lot about scope and sequence — that is, during this ‘unit’ of teaching, which can be any time-frame from a partial class period of 10-15 minutes, up to several days’ worth of lessons, what do we want to cover? That’s Scope. What order should that material be taught in? That’s Sequence. Some traditional lodge groups like the Freemasons or the Hermetic Golden Dawn folks teach scope and sequence by chunking material into grades — take an initiation, study a body of material, take an examination or perform a specific role in a ritual, and then get cleared for the next initiation, the next grade. Each grade defines a Scope of study, while the Sequence of what to study within that scope is left to the student. In Toastmasters, another lodge organization, the Sequence is given to the student in an orderly way, while the Scope is left open. In mail-order learning organizations, the Scope and Sequence are both set by the rate at which new lessons arrive, and by how frequently the student engages with that material. I’ve fallen behind on two of my classes, in fact… time to catch up. There’s potentially no ending point to this work. It can in theory go on and on, indefinitely, either with a pattern or without. If you choose to use hexagons, for example, you can use this hexagons pattern sheet to cut out hexagons for a quilt (and the diamond and the partial hexagon), and This sheet to plan a quilt’s pattern (Cut out the first sheet, and plan on the second; but you don’t get clean hexagons from the second sheet, and good edges seem to be important in EPP). Squares will also work; so will triangles. Other shapes work too, but they need to be combined in sequences — studying the platonic solids and tiling patterns are a great way to move from EPP to mathematics, and vice versa. But a lot of the scope and sequence involves learning HOW rather than learning ABOUT. There’s no way to learn how much thread attaches one hexagon to another without doing it. There’s no way to learn how to attach six hexagons to one hexagon, without doing it. There’s no way to learn how many hexagons you have to print out to make your quilt, until you’ve made some hexagon-based flowers, and discover that there’s some limits on how many of the used paper hexagons you can take out before the flower collapses without structure. Ultimately, one also has to decide whether to work with solid colors only, or whether to mix patterns and prints, flats and brocades, quilting cotton only or work other materials into the mix. One also has to decide what the smallest piece of fabric is that one is willing to work with…. I wound up cutting up my scraps to make hexagons of the right sizes, and discovered that I had quite a lot of hexagon material — far more than I had paper pieces to work with. But gradually, from experimentation, a scope and sequence emerges… what to learn, and how to learn it, and in what order to practice. Which is, ultimately, the goal of any learning process — the ability to learn something new, and practice that skill to the point where success is possible.